Following experiments undertaken during “pain classes” at Stanford University, Sean Mackey, MD, PhD who led the classes, is hoping that the increasingly detailed imaging technology which is being used in medical treatments and scientific experiments might give us some of the answers as to whether a certain treatment will be effective on a case by case basis. Students in the pain classes were asked to dip their arms into circulating ice water to see how they coped with the experience. Some of the students said they felt nothing, while others said it was very painful. This demonstrated the point which Sean Mackey was trying to make – our pain responses aren’t all the same. Since our pain responses aren’t all the same, it makes sense that not all treatments are going to have the same positive response on all patients given them. 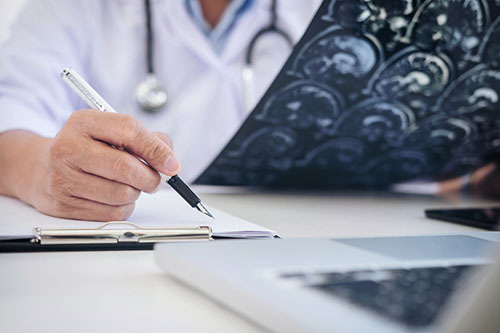 By using the better imaging technologies we now have, Mackey hopes to create “brain maps”, which will let physicians identify predictive and prognostic biomarkers such as efficacy markers, toxicity markers and surrogate endpoints. These will help to better point to a diagnosis and a prognosis as to whether a treatment will be ultimately effective for that patient based on their individual reactions to, and sources of, pain. He hopes also that, in time, the brain maps will allow physicians to prevent pain by being able to predict it in time to take action. In 2011 Mackey and his colleagues found that they could use fMRI scans (functional magnetic resonance imaging – the scans measure brain activity by detecting changes associated with blood flow), and whole-brain support vector machine learning (a method which uses models and algorithms to analyse data so that it can be sorted into separate categories) to differentiate painful from non-painful stimuli at an accuracy level of 81%. Although Mackey has cautioned that, “we are still a long way from being able to translate this into the clinical world”, it is nevertheless a positive step towards teasing apart different aspects and kinds of pain, and in doing this, better monitoring what each patient’s migraines are the result of and therefore what kind of medication is required to quell attacks. Still, a personal brain map which can identify a migraine sufferer’s exact sources of and responses to pain? A map that might allow doctors to better tailor migraine treatment to patients on an individual basis? Yes please! This was posted in Migraine treatment and tagged Brain, migraine, Scan, study. Bookmark the permalink.